control water boat a thing of the past. what it means to include a LiPo battery in a racing boat without sacrificing run times. to 2Amp charge rate. This means you will spend more time on the water and less time charging. Typical run times are approximately 7 minutes at moderate loads. 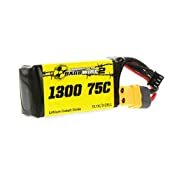 The waterproofed brushless ESC was given a boost to 30Amps with BEC. The new water-cooled brushless motor is now 40% larger to handle that increased battery kick. 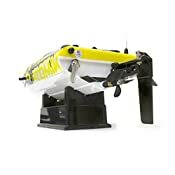 and own the fastest high speed remote control boat on the water, and title of "King Of The Seas"! during your epic run. The motor, motor mount, coupler and rudder are all alloy and anodized in black. You Will Come To Realize The Barbwire 2 Is The Best Performing And Best Valued 17 Inch Brushless Rc Boat On The Market, Bar None! 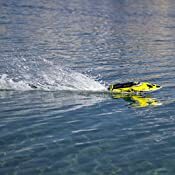 ⚡ - INSANELY FAST REMOTE CONTROL ELECTRIC BOAT! 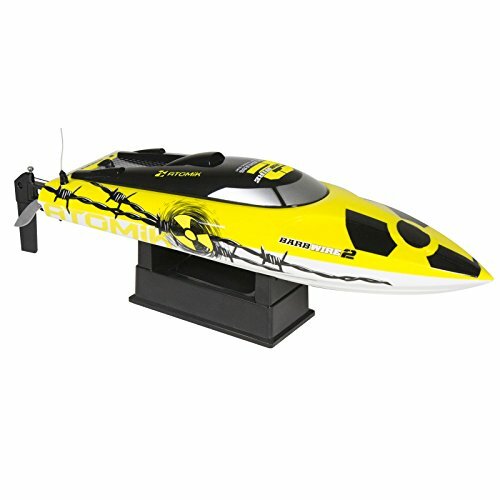 - ⚡ Atomik RC manufactures the industry leading, fastest RC boat for lakes, rivers and large pools. Our remote control speed boat travels in excess of 30 miles per hour (48 KPH), or 26 Knots for you salty sea dogs. So blazingly fast, it'll travel back in time so you can play with it as a kid again! ⚡ - SELF RIGHTING HULL KEEPS YOU DRY - ⚡ The days of wading and swimming to flip over your capsized radio control boat are over! 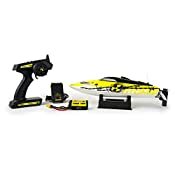 Simply, press the trigger on the transmitter for your remote boat and the generated torque from our new water-cooled brushless motor and high performance, oversized prop will right your RC racing boat immediately. ⚡ HIGH PERFORMANCE + LONG RUNTIME! 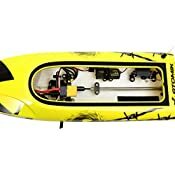 The Barbwire 2 fast remote control boat features a new upgraded, waterproof brushless (ESC) Electronic RC Speed Control and was given a boost to 30Amps with a (BEC) Battery Eliminator Circuit. A new water-cooled brushless motor is now 40% larger to handle that increased battery kick from the stock 75C LiPo battery, plus a larger prop and our RC racing boat can't be beat! ⚡ READY TO RUN ELECTRIC BOAT - ⚡ All Atomik R C boats come (RTR) Ready To Run! 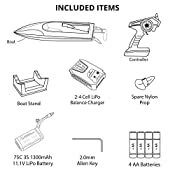 Includes: Barbwire 2 upgraded RC speedboat, 4 AAs batteries for the included Transmitter, an upgraded 75C Lithium Polymer (LiPo) for superior performance and runtime, Fast Charger, Work Stand, Spare Prop, Allen Key, and Operating Manual. ⚡ FAST, EFFICIENT, 100% USA SUPPORT - ⚡ All Atomik RC remote speed boats are backed by our dedicated US based Customer Success Team. You can expect responses to any issues quicker than our fast RC boats so you can continue your RC Adventures uninterrupted!